I think we predicted that one. Guess they'll get to the plane crash around the end of the year. Has anybody worked out the timescale for when each new year will begin? I would have thought every ten weeks or so. Also was it 1992 when they started to change the closing credit names? Meaning in order of appearance rather than length of service or seniority. It is good to see Annie credited first but I know at some stage that sadly changes. Assuming no breaks, the plane crash is the second episode on November 14. Did it really look this bad on air? Probably not, it looks like the digital compression, especially as that video doesn't seem to have been encoded at a very high bitrate, is what's rendered it unreadable. I imagine VHS noise, not very good deinterlacing and possibly satellite encryption artifacts wouldn't have helped either. No that’s Youtube it does funny things to vhs recordings, it will have converted it to progressive, vhs softness and analogue satellite for the noise on the left hand side hasn’t helped. I see. I would have been very surprised if YTV/ITV would have let it go to air like that. It seems this set of credits are affected by these issues much more than the others - perhaps the choice of background image wasn’t ideal and added to the VHS/YouTube conversion problems. BTW - who got shot in that scene, if anyone? Though how the background & text might be affected by low resolution & bitrate digital compression wouldn't have been something that passed through anyone's mind in 1992. When you see the plane crash episode, some bits seem a bit laughable, like Archie getting blown up and the slow moving flame going towards Joe Sugden's land rover, but then they wouldn't have had the biggest budget to do it, nor modern computer effects to make up for the fact you couldn't crash a real plane, or blow up and demolish half of Esholt, both of which they could do now (well, not blowing up Esholt, but as they have their own set they can destroy it in a way you can't a real village). No. It will have looked fine on-air. It still cost £1m in 1993 prices to film - over £2m in today's prices. I actually thought they did an incredible job considering the limitations of Esholt. 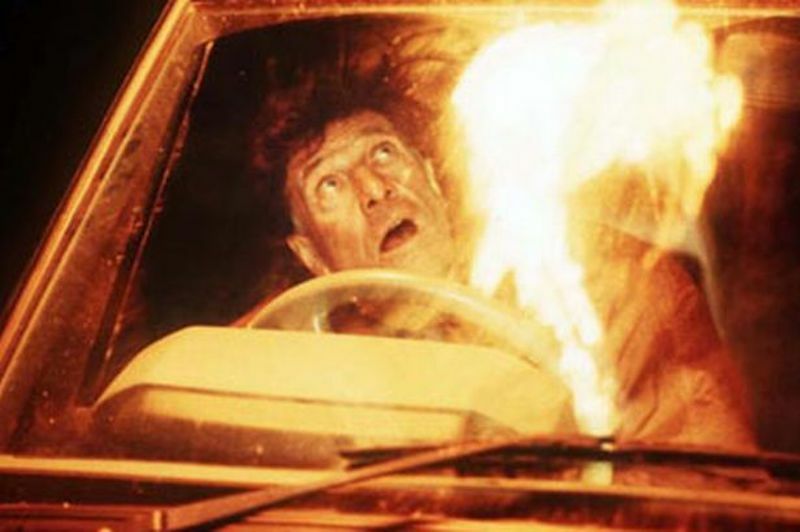 There's a lot of little tricks they did to make it look good - the famous image of the flame going over Frank's Land Rover before hitting the stable was just someone with a flame on the end of a stick, passing it over the windscreen. They simply filmed the reflection and Norman looking at it. Yet it looked incredible. A little bit behind the scenes of the plane crash here, uploaded by someone who was contracted by YTV to create the impression of a demolished Demdyke Row. It’s worth reading the description that accompanies the video. I think it was one of the most expensive TV “stunts” at the time, but I can see how they were limited without today’s CGI etc. They also either weren’t allowed to, or chose not to show any bodies from the plane - I expect the early evening time slot had something to do with that, and also the fact that the storyline was about how the tragedy affected the villagers. Information about the aircraft and the cause of the crash were very vague - a radio report was heard playing in the background of one scene, stating a wide bodied aircraft en route to Canada from Eastern Europe had crashed from 30000ft killing all 250 passengers and crew. (In the end, the death toll was 259, including nine residents of Beckindale). Despite the obvious similarity to the Lockerbie disaster, that event was referenced only once in the episodes, where Bernard McAllister stated that emergency planning had came on a long way since Hillsborough, Zeebrugge and Lockerbie. I expect YTV wanted to downplay any suggestion the storyline was based on the Lockerbie. Technically we saw bodies, but no faces - most notably with Frank recovering a baby, followed by a fantastic performance from Norman Bowler when a cop described the baby as "evidence." I think we saw Elizabeth's body but not her face. Dead bodies have been shown on screen, mind. Linda Fowler was seen as a corpse for example in 1997. I don’t recall seeing even Elizabeth’s body, and I recently watched those episodes again. In one nighttime scene you can see the shapes of aircraft seats, and I think we were meant to assume there were bodies in them. I’ve just watched part of the inquest on YouTube - it seems to be an inquest into the villagers deaths more than anything else. Obviously there would have been a full investigation into the cause of the crash, involving representatives from the UK and the country where the plane was registered, but these findings weren’t discussed in the series as far as I recall, except for one comment from someone early in the proceedings that the plane “wasn’t airworthy”. There was never any implication of terrorism or foul play. I expect that if the airline and/or manufacturer were found to be at fault, the villagers would have received compensation for both the physical damage caused and mental trauma - I’m not sure how this was portrayed in the storyline.